It must have been around 1967 when I made my first trip to Great Britain from the United States. It was there, I am reasonably certain, that I first heard the term, “knackered.” Someone used the expression “I am totally knackered,” and I gathered, from the context, that it meant that they were completely exhausted. 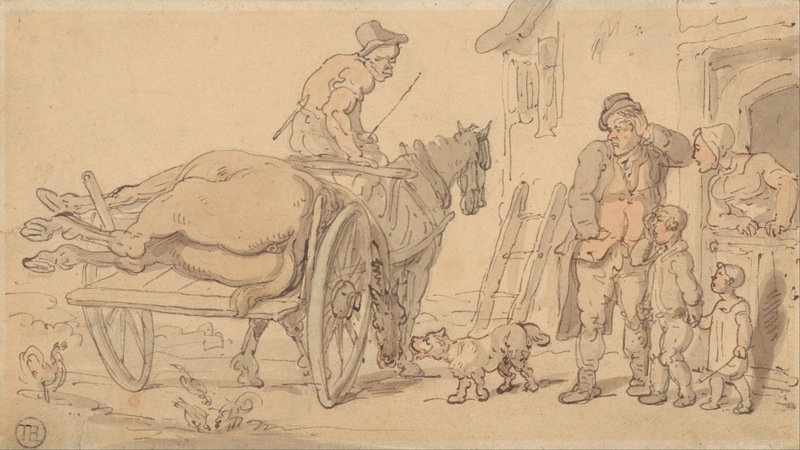 I liked the word and soon discovered that in the context of the “knacker’s yard,” it was a place in which horses that were no longer useful, whose work lives were done, were taken to be slaughtered. While it is difficult to know the exact numbers of horses in all of England at any point in the nineteenth century, estimates for the latter years of the Queen’s reign suggest that there may have been as many as 3.3 million. Citing a Parliamentary Report, Henry Mayhew, that indefatigable chronicler of the street life of the great city at mid-century, tells us that “strangers coming from the country frequently describe the streets of London as smelling of dung like a stable-yard.” This is hardly surprising when one considers even the most conservative estimates of the amount of horse manure dropped weekly in the streets of the metropolis at more than 2,000 tons. There were, of course, attempts to reduce the cruelty to horses, but it was an on-going and often up-hill battle. The most frequent forms of cruelty seem to have been as a result of badly treated horses being forced to pull heavily overloaded wagons. A typical report from 1854 describes just such a case, noting that there were several such cases. Several flagrant cases of Cruelty to Horses, by driving with heavy loads, when quite unfit for any kind of work, have been brought before the police magistrates lately. One of the worst cases was that of Mr. Robert Cheal. He is carrier to her Majesty, and it was while drawing a wagon heavily laden with wine for the royal cellar, that one of his horses was perceived in a most deplorable condition. An officer deposed to seeing the carman, Thomas Perren, standing at the horse’s head, and lashing the poor beast most unmercifully. The wagon was on a dead level, but the horse was quite unable to stir. Mr. Beadon the magistrate before whom the charge was made, satisfied himself as to the state of horse, and said it was only fit for the knacker. The wagon was stated to have contained 54 dozen of wine, a heavy load even for a horse in good condition. Nonetheless, both the Royal Society for the Prevention of Cruelty to Animals and the Animals’ Friend Society worked to reduce equine cruelty. In one month in 1865, the RSPCA claimed in The Times to have achieved 84 convictions as it continued to bring cases for the ill-treatment of horses. But clearly this was a mere drop in the ocean of cruelty. Once a horse arrived at the knacker’s yard, it was killed, broken down and everything that could possibly be used was squeezed from the animal’s corpse. Estimates of the number of animals sent to the knackers’ yards varied. At mid-century, according to one of Henry Mayhew’s informants, the number was around 720 per week. A quarter of a century later, Sir Arthur A. Helps put the figure at four or five hundred per week in London alone. Not all those horses whose work life was finished wound up in the knackers’ yards. Some few were able to enjoy their retirement years in comfort. Between the stables at Buckingham Palace and those at Windsor, there was room for about 200 horses. The Queen, in addition to being an accomplished horse-woman herself, was by 1840, patron to the Royal Society for the Prevention of Cruelty to Animals. As Helen Rappaport notes, “when they became too old for work, the queen’s horses were never sent to the knacker’s yard but were put out to grass in Windsor’s numerous lush paddocks.” Sadly, it would appear that such treatment was reserved for only a minuscule number of working horses. The proprietors of these yards purchase live and dead horses. They contract for them with large firms, such as brewers, coal- merchants, and large cab and 'bus yards, giving so much per head for their old live and dead horses through the year. The price varies from 21. to 50s. the carcass. The knackers also have contractors in the country (harness-makers and others), who bring or send up to town for them the live and dead stock of those parts. The dead horses are brought to the yard—two or three upon one cart, and sometimes five. The live ones are tied to the tail of these carts, and behind the tail of each other. Occasionally a string of fourteen or fifteen are brought up, head to tail, at one time. The live horses are purchased merely for slaughtering. But in the end, the knacker’s yards provided a significant service. In a period not generally recognized for its recycling, the yards were able to produce something of value from virtually all of the remains of the horses. Amidst the foul stench and dreadful smells of these slaughter yards, horse-hair from the mane and the tail was salvaged for stuffing mattresses, glue was made from the hooves, shoes and nails were re-used, skins were tanned for leather, bones were ground for manure, fat was boiled off and used as grease. What remained of muscle was cut up for meat and sold to the 1000 cat’s and dog’s meat vendors in London who, in turn, sold it to the owners of pets. Like any massive enterprise, there were always stories of misuse. Judith Flanders points out that “in theory, horsemeat was not sold for human consumption, but most people were sure that it was.” Even if the meat and the organs were not sold for “local” consumption, there was always the possibility that the sausages and meat pies that were eaten by many of the workers, might contain the remains of one of those horses that met their end in the knacker’s yard. To see, and download, a PDF copy of the first edition of Black Beauty, click here.